Engagement ring styles shown in a bright lite high street shop, can be a little over powering. With so much sparkle it can be very confusing and very daunting to find an engagement ring that you truly love. As an engagement ring specialist, everything is created around you & your style. How we work is a little more personal than a high street jewellers, we dont walk you to the window and ask which one you like, we start with a blank sheet of paper. Here is an overview of the options open to you when picking your engagement ring styles. Rubie Rae’s design styles explained for you, helping you to understand the types of styles you can choose from. After all, it’s all personal, so it’s up to you. If you have something else in mind, we can incorporate this too. The high street retailer offers you a number of styles to choose from. Yet most of these rings are manufactured to hit a price point, not your individual style. 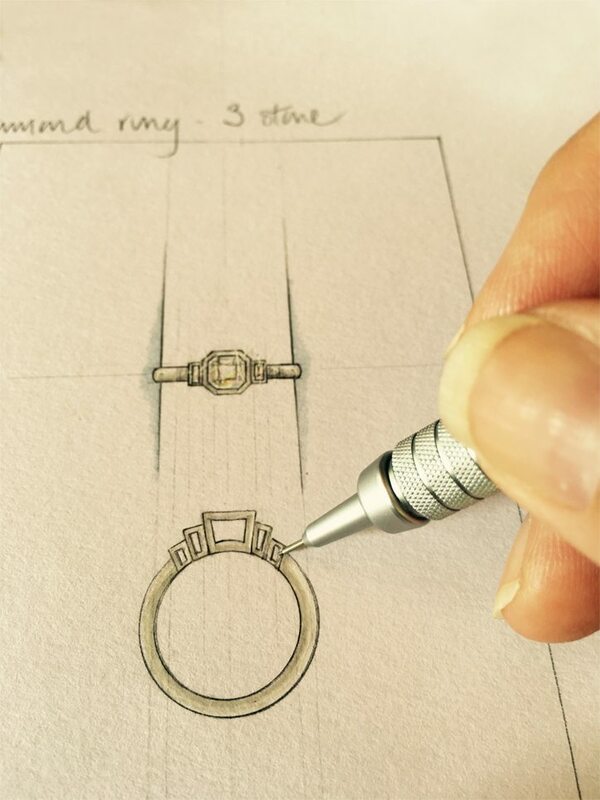 As a leading Yorkshire bespoke engagement ring designer, we can offer our clients that individuality, without breaking the bank. Round solitaire diamonds are very popular. Many men choose this type of classic-cut diamond. These are assured of never going out of style and have a tendency to be passed down to the next generation. Furthermore, a traditional solitaire setting is up-swept or clawed and raises the diamond to really show off that centre stone. Some people today select settings or shanks so the centre stone sits fairly low, creating a look that is refined and smooth. 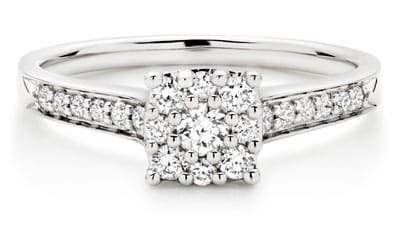 Another popular setting is the Diamond Loop Cluster Ring, which looks stunning. As the round cut continues to be popular, it is becoming more common to see the Heart cut, as well as the Pear. The Engagement Clusters are also very unique and present diamonds that reflect the contemporary design through to vintage styles. Cluster rings have become increasingly popular due to their wide range of striking designs. So what defines the new modern? Features include clean, streamlined designs for a sophisticated, smart look. The most contemporary styles feature a bezel-set and designs where the diamond hangs and looks futuristic. This look is normally captured using a tension setting. Engagement rings with coloured stones seem to be the emerging trend. With coloured diamonds becoming very popular as celebrities set new trends. Many celebrities, such as Beyoncé, have chosen coloured diamond engagement rings. The Pink diamond is definitely the most popular. For something different, consider new diamond cuts on the market. The Zales diamond cut has more facets than traditional cuts and can increase the stone’s fire. Also, consider the Modern Brilliant Cut. This type of diamond consists of 56-58 facets including the culet. Between the table and the girdle are generally thirty-two facets, and below the girdle twenty-four. The facets maximise the volume of light that is reflected from the inside and produce the greatest brilliance. Antique, vintage rings, like your grandmother might have worn, have also seen a rise in sales over these few years. Terms such as trendy, historical and period are defining the new look within current fashion. Types to look out for are gold filigree settings, floral accents and gemstone baguettes. The cuts typically are cushion, round, pillow and Asscher, which has larger facets and radiates more colour under less light. Is Palladium the new Platinum? The shank, setting, or ‘ring’, as many people will tend to call it, is very important when choosing the diamond. Palladium is definitely the hot trend. Palladium is becoming ever more popular because its rich dark colour sets off the brilliance of a diamond. This metal comes from Platinum and is naturally white and will always keep its shine, unlike yellow gold, which may tarnish. Palladium is one of the strongest precious metals and is twice as heavy as most gold alloy rings. As the price of Platinum and Gold sore, Palladium a metal that is rarer than Platinum and Gold is becoming a very strong alternative.